The IRS just released preliminary data on tax year 2011, showing total returns filed increased to 145.6 million from 142.9 million in 2010. Taxable returns, those who paid taxes, increased to 91.8 million from 84.5 million in 2010. That means in 2011 about 63.1 percent of tax filers owed federal income tax, or oppositely, 36.9 percent were nonpayers. 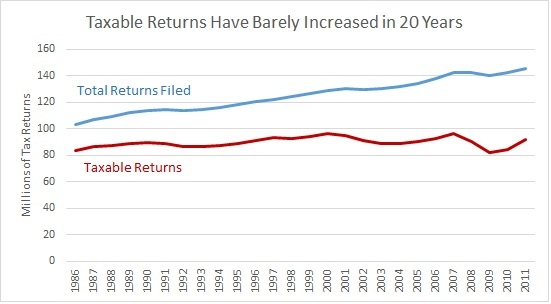 While these numbers are returning to historic norms, as the economy recovers, taxable returns continue to be about where they were in the late 1980s and 1990s (see the chart below). This is mainly because of successive expansions of refundable tax credits, such as the earned income tax credit and child credit, which have knocked millions from the tax rolls. The fact that the number of people actually paying federal income tax has been flat for about 20 years, while federal spending has skyrocketed, explains much of our current fiscal predicament.